Camp SEA Lab offers 3-day, 2-night residential Outdoor School programs for grades 5-8. Programs are designed to highlight the unique and diverse Monterey Bay coastline. Our residential programs give students an in-depth look at coastal ecosystems including sandy beach, wetlands and open ocean habitats. Students explore these ecosystems kinesthetically, by formulating questions, developing hypotheses and investigating their surrounding environment! 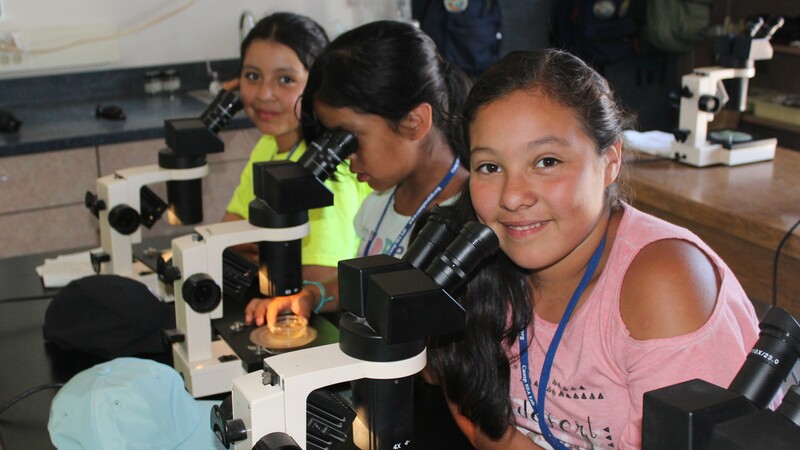 What will students learn while at Camp SEA Lab? Kayaking the Slough: Students go on an off-site field trip to Moss Landing Harbor where they learn how to kayak while observing the wildlife of the Elkhorn Slough. 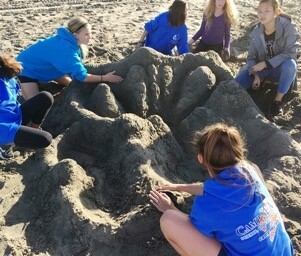 As part of their adventure, students examine adaptations of various marine mammal and bird species that call the slough home and discuss conservation efforts in effect to protect these unique species. Plankton & Food Chains: Students examine plankton samples collected from local marine habitats. They learn how to differentiate various types of plankton and explore the important role plankton plays in marine food webs. Students also build and compete in a STEM challenge to design a neutrally buoyant plankton model. Sand Crab Monitoring: After an introduction to the scientific method, students practice asking questions, designing and implementing a field experiment measuring sand crab populations, and analyzing their collected data. Marine Debris: Students examine this marine issue by learning what marine debris is and the role it plays in the health of our ocean. After completing a beach clean-up, students analyze their findings and compare to worldwide marine debris data. Watersheds: Students design a watershed model to explore the intricate connection between land and sea. While testing their models, students evaluate the simulated effects of various human impacts on their models and propose solutions to common issues threatening numerous California watersheds. Ocean Currents: Students analyze data collected from a barge spill in 1992 to determine what it can tell us about the movement of ocean currents. 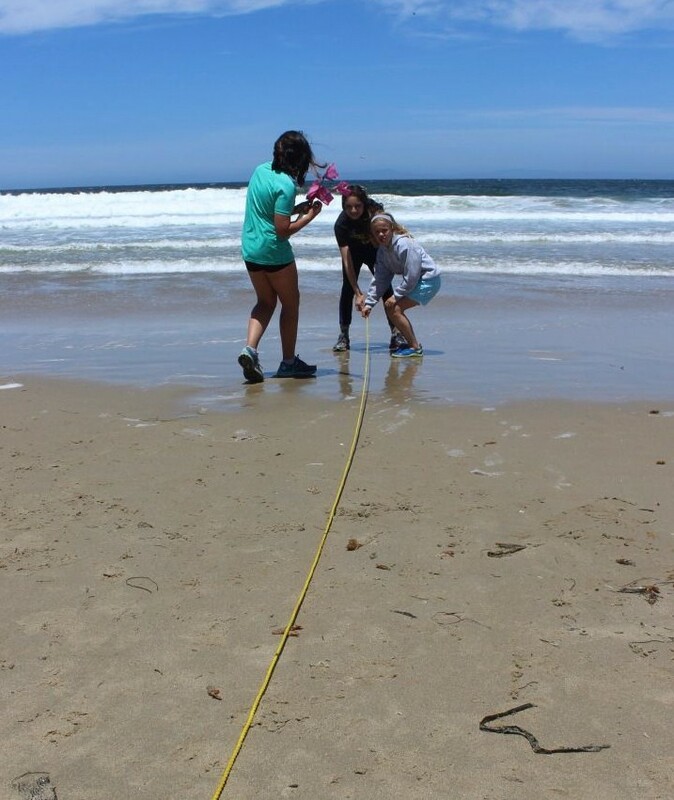 After exploring worldwide ocean current patterns, students examine the effects of currents on the transport of nutrients, animals, and debris around Earth’s surfaces. Beach Campfire: Students head down to the beach and close the evening with campfire songs & stories. This is a great way for students to enjoy some focused play time and let their silly sides show while singing and dancing alongside their classmates. Squid-Inside and Out: Student pairs explore the internal and external anatomy of the Market Squid (Loligo opalescens) during a hands-on, instructor-led dissection. A calamari tasting session will follow! Into the Abyss (Deep SEA) - Students learn about deep-sea habitats, adaptations, and the techniques used to explore this relatively unknown world. A group game illustrates the challenge of finding food in the deep sea. 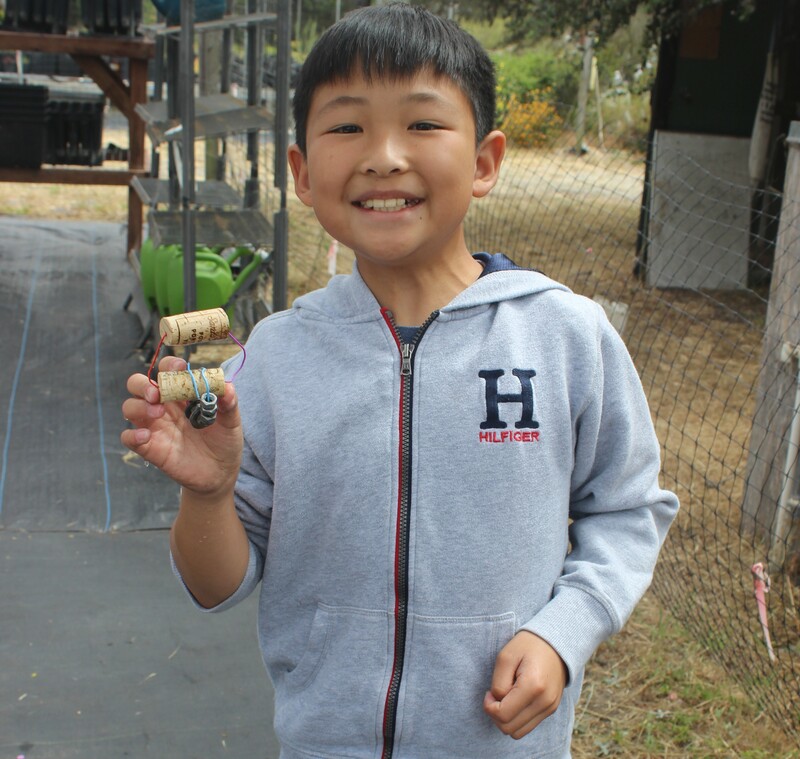 Sharks - Secrets Revealed (night hike) - Students will get to know some of the top predators in Monterey Bay by using their senses to explore the adaptations sharks possess that make them such effective survivors. Learn field techniques used to monitor sand crab populations and collect data on local populations. After learning about plankton, complete a STEM design challenge where they must create a plankton that is able to maintain neutral buoyancy. Work together and design a model watershed in the sand. Explore the anatomy of a local Cephalopod - Loligo opalescens (CA market squid) in an evening dissection program. Where is Camp SEA Lab? Camp St. Francis is the larger of our two sites, accommodating a maximum of 100 students. It is located 15 miles south of Santa Cruz in the Aptos/Seascape area and offers a private and secluded 15-acre site with private beach access. The site also includes 5 single-gender dormitories, a large dining hall, a large classroom, and ample space for outdoor activities including a sporting field, volleyball court, and basketball court. Learn more about Camp St. Francis. 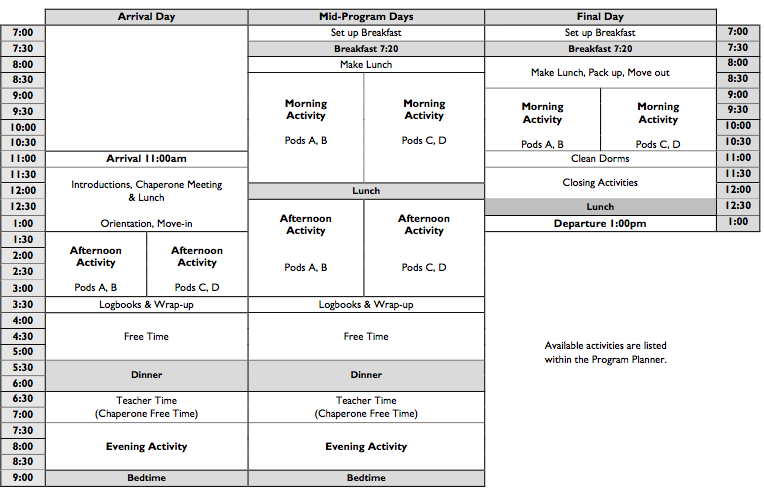 Monterey Bay Academy is the smaller of our two sites, accommodating a maximum of 39 participants. This 380-acre site is located 17 miles south of Santa Cruz, in the Pajaro/Watsonville area. The Academy offers a bunkhouse with rooms for boys and girls, as well as, a large dining hall, open playing field, a classroom equipped with marine aquaria, and private beach access. Learn more about Monterey Bay Academy. All of our residential programs have option to take an offsite field trip to go kayaking in the Elkhorn Slough. Camp SEA Lab is proud to partner with Kayak Connection - Moss Landing for all of our kayak tours. Each of our groups is assigned a Kayak Connection guide and all students are provided with life vests, splash gear, and a paddle lesson before getting on the water. 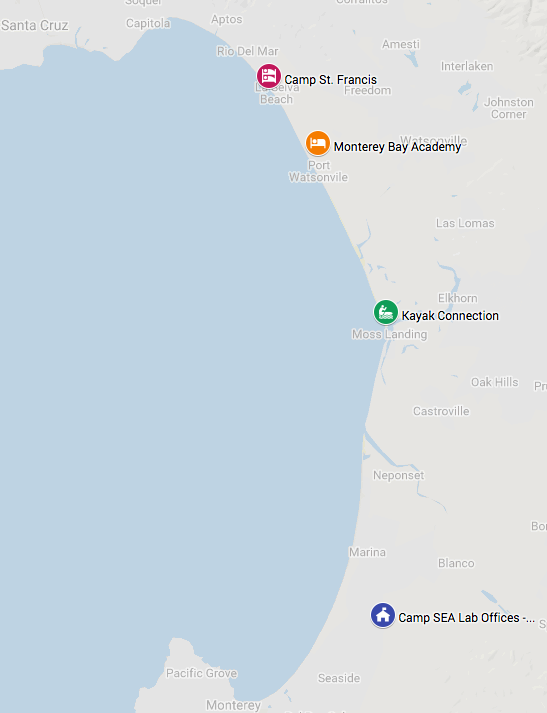 Camp SEA Lab offices are found on the campus of the University of California, Monterey Bay in Seaside/Marina. What will you need for Residential Outdoor School? Prior to attending Camp SEA Lab's Residential Outdoor School program with your school/class, you will need to complete the forms sent home by your teacher. The forms include a health form, a liability waiver, and a kayak waiver (if your school is planning to kayak). Coastal weather is highly unpredictable. We recommend bringing clothes that can be worn in layers. Activities will take place in sunshine or rain! We suggest labeling all items with your child's name. Italicized items are optional, though recommended.